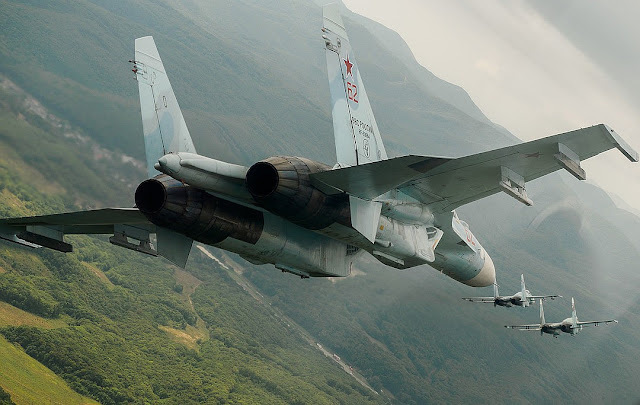 Russia to deploy warplanes Sukhoi Su-27 and Su-30's to Crimea Amid Ukraine Standoff. Russia's Ministry of Defense on Monday took up a measure in deploying more than 10 warplanes to Crimea after Foreign Minister Sergei Lavrov stated that Ukraine was preparing "a provocation near Crimea before the end of the year''. The Defense Ministry was cited as saying that the deployment was to the overhauled Belbek air base in Crimea where the fighter jets would be permanently stationed. The ministry said fighter jets, including Sukhoi Su-27 and Su-30's, will be sent to the territory as part of a "permanent deployment." The entire deployment are expected to arrive by Saturday. In comments carried by the state-run TASS news agency, Lavrov said Moscow would not allow the Ukrainian government to act on those plans, saying "they will regret it." But he also said that Russia "will not wage war against Ukraine." "We are not fighting the Ukrainian regime," Lavrov said. &quot;It is Ukrainian citizens living in Donbass who are fighting against the Ukrainian regime, which has full Nazi and neo-Nazi characteristics." Last month, Russian warships captured three Ukrainian naval vessels as they crossed through the strategic Kerch Strait, detaining 24 sailors on board. Russian authorities blamed the Ukrainian government for provocations, when Kiev's military vessels entered the Russian waters. The incident has further strained relations between Ukraine and Russia, which have been in tatters since a revolution in Ukraine that led Moscow launching a military intervention in Crimea and subsequently annexing the territory. Russia's actions were largely seen as a response to the ouster of Kremlin ally and former Ukrainian president, Viktor Yanukovych. Those events which occurred in early 2014 inflamed pro-Russia sentiment in eastern Ukraine, in triggering an armed insurgency against the Ukrainian regime. Tensions between Moscow and Kiev have also impacted relations within the Russian and Ukrainian Orthodox churches. On Saturday, a council of Orthodox bishops in Ukraine formally created a new Ukrainian church, effectively severing ties with its Russian stewardship.